Tomorrow, I, along with the rest of the UK will go to the polls to either vote to Remain as part of Europe or Leave and go it ‘alone’ in the EU Referendum. As with the Scottish indyref of 2014, one side tells us one thing whilst the other tells us another without being clear of the outcome and future that will affect us all? How do we know what is true and what isn’t? People are angry with politicians and do not trust the political system any more, hence the indyref vote being so close and the ensuing chaos of disintegrating parties everywhere. The Brexit vote will be pretty similar too. The question is which way will it go and will SNP voters in Scotland vote to leave to get their 2nd Indyref and will it make a difference either way? We’re in a time of huge political change and I firmly believe we as a nation have to change with it. It’s time for a new kind of politics, a complete overhaul of the system but where to start? Reformation is a hard fought thing but in my opinion it is needed. Politics around the world is going somewhere uncomfortable in my view. And then there is Donald Trump. It is looking likely that he could be the next President of the United States of America unless something goes drastically wrong. Of course there is a way to go yet but watching various news channels and looking at various press articles online, you get the impression that people there do not trust Hilary Clinton to lead them so would rather go for someone who is more than likely to be worse than both Bushes in George H and George W and Nixon put together. In fact I think if he does get in the world had best be prepared for any eventuality. Any hard work that has gone in to creating peace around the world could possibly unravel under him and lead to bigger problems? But that is just conjecture and theory; my own personal concerns. He is a man itching for a war and the Middle East has always been a battle ground for politicians everywhere. It is no wonder we have the problems we do today with terrorism for we are the cause of it, even training some of them too. Oh the irony. Whilst America is stuck with a difficult choice and a harsh future itself, we here in the United kingdom are also under a cloud of uncertainty. Ever since Tony Blair went from being the leader we all needed to a crusader puppy for Bush and the one we did not want, the UK has never been quite the same for me and many others. We finally woke up to the ugly truth of politics and knew we could not trust them. People trust their politicians less than they did before and large numbers do not vote because they think it does not matter which way they vote as all parties and politicians are self-serving, lying hypocrites who punish the working class and the poor and help those who are rich and ‘in the club’ so to speak. Has this not always been the way? I have been reading about the chartist movement at the moment and they fought hard for change for a better way of life for the lower classes but were worn down by the government of the time. Nothing changes much does it? So what way will I vote? Conspiracy theorist’s will have you believe that the whole thing is rigged and that it will be a vote to remain anyway no matter what and yet why is David Cameron looking nervous and getting quite snappy lately? Is it because a vote to leave is actually possible? Does he know something we don’t? I, with all my heart want to leave for I firmly believe that we can be a strong nation once again, but like the Scottish referendum and that outcome (of which this looks to have similar results); I think it best we stay in the EU for now. On our terms mind, with the changes we want and only until we can stand on our own two feet once again as a United kingdom. But earlier we have been told by Jean Claude Juncker that there will be no new deals for reform should we decide to stay so we put up or shut up basically. This could sway the vote overnight for us to leave including mine for I am now unsure of my vote and may vote Leave. Sometimes it is better the devil you know than the one you don’t though. I am not prejudiced in any way so am not looking at the immigration side of things although I despise racism with all my heart and any sort of prejudice at all. I am an idealist who just wants people to get along and yet cynical because people are inherently selfish and greedy. I like the idea of freedom of movement for all (although there should be tight rules here in some cases) and want the UK to remain as so but become stronger. I would also like to see the Commonwealth become stronger and play a larger part in trade and commerce with the UK to make us a powerhouse to be reckoned with. Ireland is our biggest trade partner. Let’s strengthen that and create more jobs and work together like never before. Combined altogether we could become a strong union but as with all unions, it would need to be monitored closely to make sure rules and regulations are being adhered to and corruption is kept at bay. The EU is a brilliant idea but sadly it is broken and in chaos at the moment. The immigration and refugee crises (two different things here that confuse many) are at the forefront of people’s minds and so vote with this reason as well as the murder of Jo Cox. At the end of the day the ordinary person worries about jobs, homes and putting food on the table as well as being in a position to pay the bills so seeing the news items of people risking their lives to get to certain countries and ‘taking’ all that they need is a worry to them. But this crises is not the only concern although the far right parties that seem to be growing in stature is something to worry about and we really all should be worried. Surprisingly The Queen has the power to show no confidence in her government and raise a militia should she feel the need. She would get a lot of support now methinks but that is in the realm of fantasy. The politicians never listen to the people, even in the wake of public outcries and close call referendums. Stay in the EU or vote Leave by all means but it is OUR political system that is broken and needs fixing first and foremost. That is the change we need to make. It is time the politicians worked for us and not their own agenda’s. It is time they listened and did as we asked as long as it’s feasible. It is time for reformation. Just how we go about it time will soon tell. I only hope that we all make the right choice tomorrow and those that are not going to vote change their minds and do so. 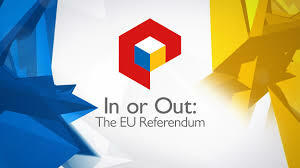 Friday we shall see if we will Remain or break away from the European Union. I will make my final decision at the Ballot box tomorrow.